This article is about the type of wine. For the birthmark, see Port-wine stain. For the Krazy Kat short, see Port Whines. Port wine (also known as Vinho do Porto, Portuguese pronunciation: [ˌviɲuduˈpoɾtu], Porto, and usually simply port) is a Portuguese fortified wine produced exclusively in the Douro Valley in the northern provinces of Portugal. It is typically a sweet, red wine, often served as a dessert wine, though it also comes in dry, semi-dry, and white varieties. Fortified wines in the style of port are also produced outside Portugal, most notably in Australia, France, South Africa, Canada, India, Argentina, and the United States. Under European Union Protected Designation of Origin guidelines, only the product from Portugal may be labelled as port or Porto. In the United States, wines labelled "port" may come from anywhere in the world, while the names "Oporto", "Porto", and "Vinho do Porto" have been recognised as foreign, non-generic names for Port wines originating in Portugal. Port is produced from grapes grown and processed in the demarcated Douro region. The wine produced is then fortified by the addition of a neutral grape spirit known as aguardente in order to stop the fermentation, leaving residual sugar in the wine, and to boost the alcohol content. The fortification spirit is sometimes referred to as brandy but it bears little resemblance to commercial brandies. The wine is then stored and aged, often in barrels stored in a Lodge (meaning "cellar") as is the case in Vila Nova de Gaia, before being bottled. The wine received its name, "port", in the later half of the 17th century from the seaport city of Porto at the mouth of the Douro River, where much of the product was brought to market or for export to other countries in Europe. The Douro valley where port wine is produced was defined and established as a protected region, or appellation in 1756, making it the third oldest, after Chianti (1716) and Tokaj (1730). 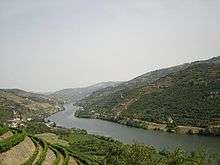 The reaches of the valley of the Douro River in northern Portugal have a microclimate that is optimal for cultivation of olives, almonds, and especially grapes important for making port wine. The region around Pinhão and São João da Pesqueira is considered to be the centre of port production, and is known for its picturesque quintas—farms clinging on to almost vertical slopes dropping down to the river. The demarcation of the Douro River Valley includes a broad swath of land of pre-Cambrian schist and granite. Beginning around the village of Barqueiros (located about 70 km (43 mi) upstream from Porto), the valley extends eastward nearly to the Spanish border. The region is protected from the influences of the Atlantic Ocean by the Serra do Marão mountains. The area is sub-divided into 3 official zones-the Baixo (lower) Corgo, the Cima (higher) Corgo and the Douro Superior. Baixo Corgo – The westernmost zone located downstream from the river Corgo, centred on the municipality of Peso da Régua. This region is the wettest port production zone, receiving an average of 900 mm, and has the coolest average temperature of the three zones. The grapes grown here are used mainly for the production of inexpensive ruby and tawny ports. Cima Corgo – Located further upstream from the Baixo Corgo, this region is centred on the town of Pinhão (municipality of Alijó). The summertime average temperature of the regions are a few degrees higher and rainfall is about 200 mm less. The grapes grown in this zone are considered of higher quality, being used in bottlings of Vintage, Reserve, aged Tawny and Late Bottled Vintage Ports. Douro Superior – The easternmost zone extending nearly to the Spanish border. This is the least cultivated region of Douro, due in part to the difficulties of navigating the river past the rapids of Cachão da Valeira. This is the most arid and warmest region of the Douro. The overall terrain is relatively flat with the potential for mechanization. Over a hundred varieties of grapes (castas) are sanctioned for port production, although only five (Tinta Barroca, Tinta Cão, Tinta Roriz (Tempranillo), Touriga Francesa, and Touriga Nacional) are widely cultivated and used. Touriga Nacional is widely considered the most desirable port grape but the difficulty in growing it and the small yields cause Touriga Francesa to be the most widely planted grape. White ports are produced the same way as red ports, except that they use white grapes—Donzelinho Branco, Esgana-Cão, Folgasão, Gouveio, Malvasia Fina, Rabigato and Viosinho. While a few shippers have experimented with Ports produced from a single variety of grapes, all Ports commercially available are from a blend of different grapes. Since the Phylloxera crisis, most vines are grown on grafted rootstock, with the notable exception of the Nacional area of Quinta do Noval, which, since being planted in 1925, has produced some of the most expensive vintage ports. In 2013, there were 8.7 million cases of port sold, 3.6% less than the previous year, at a value of $499 million. Port sales have been declining since 2005 and are down 16% from that year. Declining sales are attributed by some to increasing prices, due to the increased cost of alcohol used in the production process. Declining sales have been attributed to the global rise in alcohol levels of table wines. As of 2014, the leading brand in Portugal is Cálem, which sells 2.6 million bottles annually. A barco rabelo carrying some Port wine barrels. While port is produced from grapes grown in the Douro valley, until 1986 it could only be exported from Portugal from Vila Nova de Gaia near Porto, Portugal's second-largest city. Traditionally, the wine was taken downriver in flat-bottom boats called 'barcos rabelos', to be processed and stored. However, in the 1950s and 1960s, several hydroelectric power dams were built along the river, ending this traditional conveyance down the river. Currently, the wine is transported from the vineyards by tanker trucks and the barcos rabelos are only used for racing and other displays. Port wine is typically richer, sweeter, heavier, and higher in alcohol content than unfortified wines. This is caused by the addition of distilled grape spirits (aguardente similar to brandy) to fortify the wine and halt fermentation before all the sugar is converted to alcohol, and results in a wine that is usually 19 to 20% alcohol. Port is commonly served after meals as a dessert wine in English-speaking countries, often with cheese, nuts or chocolate; white and tawny ports are often served as an apéritif. 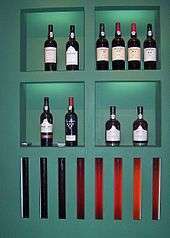 In Europe all types of port are frequently consumed as aperitifs. Different port wines with corresponding colour. Wines matured in sealed glass bottles, with no exposure to air, experience what is known as "reductive" ageing. This process leads to the wine losing its colour very slowly and produces a wine which is smoother on the palate and less tannic. Wines that have matured in wooden barrels, whose permeability allows a small amount of exposure to oxygen, experience what is known as "oxidative" ageing. They too lose colour, but at a faster pace. They also lose volume to evaporation (angel's share), leaving behind a wine that is slightly more viscous. The IVDP (Instituto dos Vinhos do Douro e Porto) further divides port into two categories: normal ports (standard rubies, 3 year old tawnies and white ports) and Categorias Especiais, special categories, which include everything else. Aged tawny ports are wines made from red grapes that are aged in wooden barrels exposing them to gradual oxidation and evaporation. As a result, from this oxidations they gradually mellow to a golden-brown colour. The exposure to oxygen imparts "nutty" flavours to the wine, which is blended to match the house style. Aged tawny ports are sweet or medium dry and typically consumed as a dessert wine, but can also pair with a main course. When a port is described as tawny, without an indication of age, it is a basic blend of wood aged port that has spent time in wooden barrels. Above this are tawny with an indication of age which represent a blend of several vintages. The port characteric, of the years in wood, is stated on the label. The official categories are 10, 20, 30 and over 40 years. The categories indicate a target age profile for the ports, not their actual ages, though many people mistakenly believe that the categories indicate the minimum average ages of the blends. 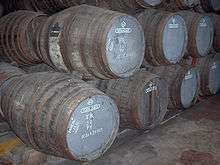 It is also possible to produce an aged white port in this manner, with a number of shippers now marketing aged white ports. 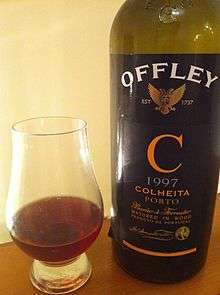 A Colheita Port is a single vintage wine fortified and aged in tawny style for at least seven years. Instead of an indication of age (10, 20,...) the actual vintage year is mentioned. 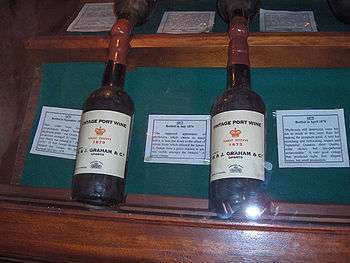 However, Colheita Ports should not be confused with Vintage Port (see below): whereas a Vintage port will spend only around 18 months in barrels after harvest and will continue to mature in bottle, a Colheita may have spent 20 or more years in wooden barrels before being bottled and sold. A number of white Colheitas have also been produced. Garrafeira is an unusual and rare intermediate vintage dated style of port made from the grapes of a single harvest that combines the oxidative maturation of years in wood with further reductive maturation in large glass demijohns. It is required by the IVDP that wines spend some time in wood, usually between three and six years, followed by at least a further eight years in glass, before bottling. In practice the times spent in glass are much longer. The style is most closely associated with the company Niepoort, although others do exist. Their dark green demijohns, affectionately known as bon-bons, hold approximately 11 litres (2.4 imp gal; 2.9 US gal) each. Some connoisseurs describe Garrafeira as having a slight taste of bacon, although many people will neither notice nor understand such a description; the reason being that, during the second phase of maturation, certain oils may precipitate, causing a film to form across the surface of the glass that can be tasted by those who are accustomed to the difference between Garrafeira and other forms of port. 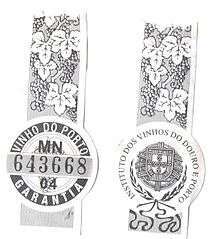 Confusingly, the word Garrafeira may also be found on some very old tawny labels, where the contents of the bottle are of exceptional age. Reserve port is a premium ruby port approved by the IVDP's tasting panel, the Câmara de Provadores. 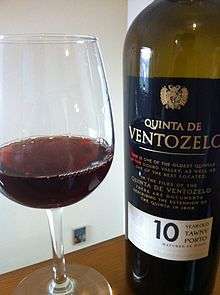 In 2002 the IVDP prohibited the use of the term "Vintage Character", as the wine had neither a single vintage (usually being a blend of several vintages of ruby port) nor the typical character of vintage port. Croft cellar in Vila Nova de Gaia, Portugal. Rose port is a very recent variation on the market, first released in 2008 by Poças and by Croft, part of the Taylor Fladgate Partnership. It is technically a ruby port, but fermented in a similar manner to a rosé wine, with a limited exposure to the grape skins, thus creating the rose colour. It has enjoyed little critical acclaim. White port is made from white grapes and can be made in a wide variety of styles, although until recently few shippers have produced anything other than a standard product. Ordinary white ports make an excellent basis for a cocktail while those of greater age are best served chilled on their own. Sweet white port and tonic water is a commonly consumed drink in the Porto region. There are a range of styles of white port, from dry to very sweet. Lagrima, meaning "tears of Christ", is the name for the sweetest style of white Port. When white ports are matured in wood for long periods, the colour darkens, eventually reaching a point where it can be hard to discern (from appearance alone) whether the original wine was red or white. The filtered wine has the advantage of being ready to drink without decanting and is usually bottled in a stoppered bottle that can be easily resealed. However, many wine experts feel that this convenience comes at a price and believe that the filtration process strips out much of the character of the wine. The accidental origin of late bottled vintage has led to more than one company claiming its invention. The earliest known reference to a style of port with this name in a merchant's list is to be found in The Wine Society's catalogue from the spring of 1964; which includes Fonseca's Quinta Milieu 1958, bottled in the UK, also in 1964. By the 1962 vintage, LBV was being produced in Portugal and bottled as LBV. LBV is intended to provide some of the experience of drinking a vintage port but without the need for lengthy bottle ageing. To a limited extent it succeeds, as the extra years of oxidative ageing in barrel does mature the wine more quickly. Unfiltered LBV can age as long as Vintage Ports and are very difficult to identify as LBVs when inserted into blind tastings of Vintage Ports. Typically ready to drink when released, filtered LBV ports are the product of a single year's harvest and tend to be lighter bodied than a vintage port. Filtered LBVs can improve with age, but only to a limited degree; whereas the unfiltered wines will usually be improved by extra years in the bottle. Since 2002, bottles that carry the words "bottle matured" must have enjoyed at least three years of bottle maturation before release. Although crusted ports will improve with age, the blender often seeks to make these wines approachable at a younger age than for Vintage ports. The date on a crusted port bottle refers to the bottling date, not the year the grapes were grown. While crusted port is required to be aged in bottle for at least three years before it is released to the market, most producers keep the bottles for considerably longer, so they are ready to be drunk when sold, and may be enjoyed by consumers who have no space to cellar bottles. This makes crusted port a popular and affordable alternative to vintage port. Vintage port is made entirely from the grapes of a Declared Vintage year and accounts for about two percent of overall port production. Not every year is declared a Vintage in the Douro. The decision on whether to declare a Vintage is made in the spring of the second year following the harvest. The decision to declare a Vintage is made by each individual port house, often referred to as a "Shipper". The port industry is one where reputations are hard won and easily lost, so the decision is never taken lightly. During periods of recession and war, potential "Declarations" have sometimes been missed for economic reasons. In recent years, some Shippers have adopted the "chateau" principle for Declarations, Declaring all but the worst years. More conventional Shippers will Declare, on average, about three times a decade. While it is by far the most renowned type of port, from a volume and revenue standpoint, Vintage port actually makes up only a small percentage of the production of most shippers. Vintage ports may be aged in barrels or stainless steel for a maximum of two and a half years before bottling, and generally require another ten to forty years of ageing in the bottle before reaching what is considered a proper drinking age. Since they are potentially aged in cask for only a short time, they retain their dark ruby colour and fresh fruit flavours. Particularly fine Vintage ports can continue to gain complexity and drink wonderfully for many decades after they were bottled. It is not uncommon for 19th century bottles to still be in perfect condition for consumption. The oldest known Vintage Port still available from a Shipper is the 1815 Ferreira which is still in excellent drinking condition. Single Quinta Vintage ports are wines that originate from a single estate, unlike the standard bottlings of the port wine houses which can be sourced from a number of quintas. Single Quinta bottlings are used in two different ways by different producers. Most of the large port wine houses have a single Quinta bottling which is only produced in some years when the regular Vintage port of the house is not Declared. In those years, wine from their best quinta is still bottled under a Vintage designation, rather than being used for simpler port qualities. In a sense, this kind of single Quinta is a "second wine" of the regular Vintage port and is typically sold slightly cheaper than the regular Vintage Port. Graham's Quinta dos Malvedos and Taylor's Quinta de Vargellas are examples of this kind of port. Typically, this type of single Quinta bears the name of both a major port wine house and the name of a Quinta. In recent times, there has also been an increase in the production and marketing of single Quinta Vintage port as high-end wines. Vintage port from small producers situated in the Douro valley are almost always single Quinta wines and labelled as such. Quinta do Crasto is an example of this kind of Port. Some of the larger port wine houses also have introduced single Quintas which are run as separate estates, rather than as a source of wine for the house's main bottling. Symington Family Estates' Quinta do Vesuvio is an example of this. Typically, this type of single Quinta only bears the name of its Quinta. Vintage port should not be confused with "Late Bottled Vintage" (see above). The term vintage has a distinct meaning in the context of Vintage port. While a vintage is simply the year in which a wine is made, most producers of Vintage port restrict their production of year-labeled bottlings to only the best years, a few per decade. In intermediate years, the producers of blended vintage ports will not Declare their flagship port, but may decide to Declare the Vintage of a single Quinta, e.g., the 1996 Dow's Quinta do Bomfim and Taylor's Quinta de Vargellas. Some houses declare their wines in all but the worst years: Quinta do Vesuvio has declared a Vintage every year with the exceptions of 1993 and 2002. Improved wine-making technologies and better weather forecasts during the harvest have increased the number of years in which a Vintage can be Declared. Although there have been years when only one or two wines have been Declared, it is over thirty years since there was a year with no Declarations at all. 2011 was declared a vintage year by most producers. The quality of the grape harvest was attributed to ideal rainfall and temperature. Other recent widely declared vintage years were 2007, 2003, 2000, 1997 and 1994. Sandeman cellar, Vila Nova de Gaia, Portugal. The wine producing Douro region is the third oldest protected wine region in the world after the Tokaj-Hegyalja region in Hungary, established in 1730, and Chianti, in 1716. In 1756, during the rule of the Marquês de Pombal, the Companhia Geral da Agricultura das Vinhas do Alto Douro (C.G.A.V.A.D., also known as the General Company of Viticulture of the Upper Douro or Douro Wine Company), was founded to guarantee the quality of the product and fair pricing to the end consumer. The C.G.A.V.A.D. was also in charge of regulating which port wine would be for export or internal consumption and managing the protected geographic indication. Port became very popular in England after the Methuen Treaty of 1703, when merchants were permitted to import it at a low duty, while war with France deprived English wine drinkers of French wine. Contrary to popular belief, Port was not created by British sailors by spiking the wine with brandy to avoid spoilage during the long voyage north. More accurately, British importers could be credited for recognizing that a smooth, already fortified wine that would appeal to English palates would coincidentally survive the trip to London. In 1678, a Liverpool wine merchant sent two new representatives to Viana do Castelo, north of Oporto, to learn the wine trade. While on a vacation in the Douro, the two gentlemen visited the Abbot of Lamego, who treated them to a "very agreeable, sweetish and extremely smooth" wine," which had been fortified with a distilled spirit. The two Englishmen were so pleased with the product that they purchased the Abbot's entire lot and shipped it home. The continued English involvement in the port trade can be seen in the names of many port Shippers and brands: Broadbent, Cockburn, Croft, Dow, Gould Campbell, Graham, Osborne, Offley, Sandeman, Taylor, and Warre being amongst the best known. Shippers of Dutch and German origin are also prominent, such as Niepoort and Burmester. The British involvement grew so strong that they formed a trade association that became a gentlemen's club. A few port Shippers and producers were also established by native Portuguese families: Ferreira and Quinta do Crasto are among the best. Both Ferreira and Quinta do Crasto can be credited for pioneering the Douro as a table wine producing region, Ferreira making Barca Velha since 1952 and Quinta do Crasto becoming the second producer of note, starting in the early 1990s. Port, like other wine, should be stored in a cool but not cold, dark location (as light can damage the port), with a steady temperature (such as a cellar), laying the bottle on its side if the bottle has a cork, or standing up if stoppered. With the exception of white port, which can be served chilled, port should be served at between 15 and 20 degrees Celsius (59 to 68 degrees Fahrenheit). Tawny port may also be served slightly cooler. Port wines that are unfiltered (such as vintage ports, crusted ports and some LBVs), form a sediment (or crust) in the bottle and require decanting. This process also allows the port to breathe. Because it is a crucial mistake to disturb the sediment before decanting, which if disturbed may take days to resettle and thus render the bottle unattractive for the intended event, a unique method of opening the bottle to allow decanting without disturbing the sediment has evolved, using wooden-handled heated (red-hot) iron "port tongs", the business end of which have been bent to, when closed, surround the bottle neck. The technique requires the tong ends to be heated to be glowing fairly red hot and then applied to the bottle neck just below the cork, while the bottle is held firmly in place by the bottom (without any movement which may disturb the sediment). Once the heated tongs have been on the glass for about half a minute, the tongs are sharply twisted, or perhaps more certainly an ice cube or towel dipped in ice water is applied to the hot neck, the effect of which is to cause the bottle neck at the point of heated contact to snap off cleanly (i.e., no shards of glass). Thus, the wine is opened without even the potential for disturbing the sediment inherent in using a corkscrew. Obviously, this requires a practised hand, and is also quite theatrical and impressive when done correctly (and embarrassing, messy, and even dangerous when exhibited by a novice). To ensure no glass or sediment, the port should be poured into the decanter through a filter. Port is the only wine typically opened in this fashion (although any old wine with sufficient sediment could also be, counter-productively struck on the head of the bottle neck to cause it to snap off). The same practice may also be used when opening champagne bottles. While neither holds any practical purpose on modern bottles, the pageantry is enough to rationalize the ritual. The practice has a practical use only on bottles which predate the 1960s, if the neck of the bottle balloons out in the middle. After the cork has settled into the shape of the neck of the bottle, it is impossible to extract it, because the cork has dried out in the middle, without it breaking in two. The solution is to allow the cork to break in half, pushing the bottom part into the bottle, or using port tongs to break the neck of the bottle as described above. Once opened, port generally lasts longer than unfortified wine but is still best if consumed within a short period of time. Tawny, ruby and LBV ports may keep for several months once opened—because they are aged longer in barrels these ports have already been exposed to some degree of oxidation. Old Vintage ports are best consumed within several days of opening but young Vintage Ports can be kept open for several weeks, if not months when very young. Tradition in the United Kingdom calls for port being served at a formal dinner to be passed to the left ("pass the port to port") and for the bottle or decanter not to touch the table on its way around, though some cultures reject this tradition. If a diner fails to pass the port, others at the table may ask them "Do you know the Bishop of Norwich?" The Port and Douro Wines Institute is an official body belonging to the Ministry of Agriculture of Portugal and is a key institution in promoting the industry and knowledge of making port wine. It was previously known as the Instituto do Vinho do Porto. Producers of port wine are often called "Shippers". In the early history of the port wine trade, many of the most powerful shipping families were British [English, Scottish and Irish] and Irish; this history can still be seen in the names of many of the most famous port wines. Over the years Portuguese, as well as Dutch, German owned shippers have also become prevalent in the port industry. Porto, a World Heritage Site, is home to many famous port houses located near the Douro River, making the shipping of port wine easy. Some of these port houses are private, while others are open to public tours and visits. Port has been used in the past as a healing agent in earlier remedies. The British Prime Minister William Pitt the Younger was given port for gout as a boy. He began at the age of 14 (1773) with a bottle a day according to J. Ehrman (1969): "The Younger Pitt". However, heavy alcohol consumption is known to exacerbate gout. A recurring theme in the novels of Anthony Trollope is the partiality of respectable elderly ladies for port, which they excuse on the grounds that it is "medicinal". Aged port wine contains a family of bluish phenolic pigments called portosins (vinylpyranoanthocyanins) and oxovitisin A, an oxovitisin, a type of pyranoanthocyanin with a 2-pyrone component. Portello, a non-alcoholic soft drink based on the flavour of the wine. ↑ "Office of the Law Revision Counsel, U.S. House of Representatives" Archived 11 May 2013 at the Wayback Machine. ↑ "Alcohol Levels and Wine". graperadio. 29 June 2009. Retrieved 23 May 2016. ↑ Hamish Smith (5 June 2014). "Bright Outlook Port Side". drinksint.com. Retrieved 20 November 2015. ↑ "An explanation of "Vintage Character" from "Britain's oldest wine and spirit merchant"". Bbr.com. Retrieved 2013-10-28. ↑ Larry Lipson (26 May 2006). "To filter or not to filter? That is the question". L.A. Daily News. Retrieved 28 September 2006. 1 2 Antunes, Luis (24 April 2013). "Major Port Houses Declare 2011 Vintage". Wine Spectator. Retrieved 27 November 2015. ↑ Sarah Ahmed (29 April 2013). "Tried & tasted: Sandeman, Ferreira & Offley 2011 Vintage Ports". thewinedetective.co.uk/. Retrieved 27 November 2015. ↑ Voss, Rogeer (26 Oct 2012). "5 Misconceptions of Vintage Port". Wine Enthusiast Magazine. ↑ J. Ehrman (1969), "The Younger Pitt"
↑ Mateus, N; Oliveira, J; Haettich-Motta, M; De Freitas, V (2004). "New Family of Bluish Pyranoanthocyanins". Journal of biomedicine & biotechnology. 2004 (5): 299–305. doi:10.1155/S1110724304404033. PMC 1082895 . PMID 15577193. ↑ He, Jingren; Oliveira, Joana; Silva, Artur M. S.; Mateus, Nuno; De Freitas, Victor (2010). "Oxovitisins: A New Class of Neutral Pyranone-anthocyanin Derivatives in Red Wines". J. Agric. Food Chem. 58 (15): 8814–8819. doi:10.1021/jf101408q. Wikimedia Commons has media related to Port wine.